I don’t know about you, but I don’t know what makes me cringe more when my daughter goes to Starbucks, the price tag or the lack of nutrients in those frappucinos. Here is a compromise we have come up with at home. She still loves to go to Starbucks, but making these drinks at home has cut back on the frequency of our visits. First of all I have to give credit to finding out about Dandy Blend from the fabulous Meghan Telpner. If you don’t know about her, you should. She is the author of a book called the Undiet and she is definitely worth following on social media. 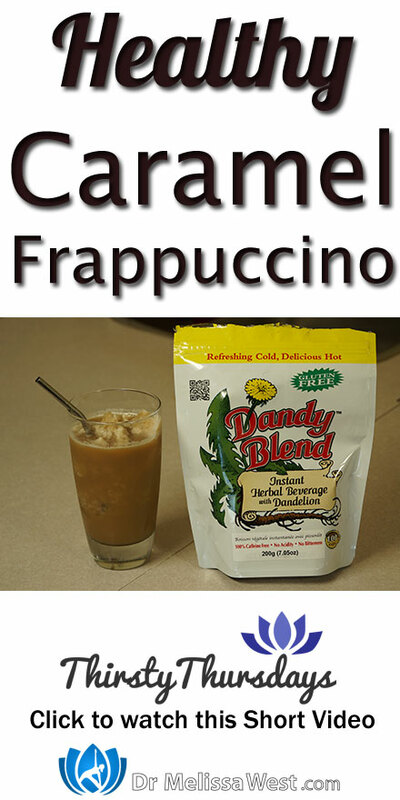 The most attractive thing to me about dandy blend is that it is made from dandelion, chicory and beet roots. Dandelion nourishes and cleanses your liver, is a blood builder and purifier, treats anemia, detoxifies your body, stimulates bile production which helps with digestion, reduces bloating, reduces bloating, decreases glucose levels, discourages the growth of harmful bacteria, provides relief from indigestion and heartburn, clears your skin (great for our teenagers who suffer from acne), reduces allergies, and flushes foreign particles from your gallbladder. Chicory improves digestion, reduces LDL (the bad) cholesterol in your body so it is beneficial for those who suffer from heart disease, cancer prevention, reduces arthritis pain, weight loss, immunity boost, reduces anxiety, and kidney health. 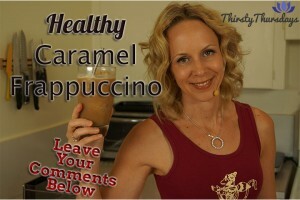 So let’s make a healthier, thriftier vegan caramel frappuccino.